Welcome to the Airbrush Depot at Rex Art! Here you will find an exceptional selection of your favorite airbrushing products from manufacturers like Iwata, Paasche, Sparmax, Badger and more. 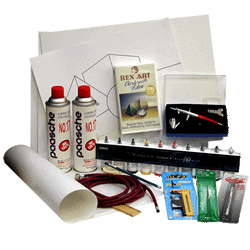 Plus, at the Rex Art Airbrush Depot you can always count on a great price and free shipping for orders greater than $100*. If you have a question, comment, or just want to chat please do not hesitate to contact us via email or call us at 800-REX-ART2. We take your airbrushing needs seriously, and professional help is just a phone call or email away. Don't forget to check back often, as we are always adding new products and specials. Icon legend: Green art supply Oversized - additional shipping may apply. Item may be drop shipped from the manufacturer. Must be shipped via truck. Additional shipping will apply. Click on the truck for more information.